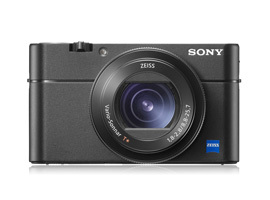 Featuring a large 1”-type BSI (back-side illuminated) sensor, which is physically larger than the sensor typically used in many compact cameras, the Sony RX100 V is capable of some very good image quality. The 20.1Mp packs plenty of resolution for detailed shots, and the peak Portrait and Landscape scores recorded at base ISO 80 aren’t far off the results for mirrorless Micro-Four-Thirds cameras — and even for some DSLRs with APS-C sensors. As you might expect, the Sony RX100 V’s Sports (low-light ISO) score is a little lower than we see with bigger sensors, resulting in higher levels of noise when shooting at higher ISO sensitivities. Essentially using the same sensor as its predecessor, image quality is almost identical between the Mark IV and Mark V. The tweak in the ISO sensitivity range, now 80 – 12,800 on the RX100 V compared to 125 – 25,600 on the Mark IV, has affected the scores only marginally, with slightly lower scores on the Mark V in all metrics, but it’s fair to say that they offer the same image quality. Against Sony’s own A6300 mirrorless camera featuring a larger APS-C sensor, we can see the RX100 V’s scores lag behind a little, with essentially one stop lower image quality in all categories at base ISO. However, scores are much more comparable to those for the Micro-Four-Thirds chip used in the Olympus PEN-F hybrid, which in physical size is between the RX100 V’s 1”-type sensor and the Sony A6300 APS-C sensor. Where the smaller 1”-type chip does fall down in performance is in the Sports (low-light ISO) category. As you can see from the graph, the RX100 V achieves excellent noise ratios around 38bD only at its base ISO sensitivity of ISO 80; and although it maintains good ratios above 32bD up to manufacturer ISO 800, at higher sensitivities noise starts to become more of a problem in RAW files. In practical terms, high-speed action photography using the new 315-point autofocus system and 24fps burst shooting will be much more successful when shooting outdoor action in good light so as to achieve fast shutter speeds without having to increase the ISO too much. High-quality indoor images in low light are going to be challenging for the RX100 V, however, considering the noise at high ISO settings and use of the build-in pop-up flash. Where low-light image quality is paramount, a mirrorless APS-C hybrid with improved high ISO performance and compatibility with wider-aperture f/1.4 prime lenses and external flashguns would offer a serious advantage, but less versatility and convenience. Excellent dynamic range of over 10 EV is possible on the RX100 V up to manufacturer ISO 800, and remains a respectable 8 EV or above up to ISO 6400. The camera obviously achieves its best results at the lower ISO sensitivities, and outstanding dynamic range above or around 12 EV is possible with the RX100 V up to ISO 200. Color sensitivity holds up even better on the RX100 V at higher ISO sensitivities. While the camera achieves optimum color around 23 bits at ISO 80, it maintains very good color above 20 bits at ISO 400, with good color around 17 bits still possible up to ISO 1600. Taking account of all the RX100 V sensor metrics, shooting landscapes or portraits either in good light or with the use of a tripod at the lower ISO sensitivities up to ISO 400 will yield some very good results. Increasing ISO up to 800 or 1600 will still achieve acceptable color and dynamic range, but RAW files at higher ISOs will benefit from some post-production smoothing to reduce the higher levels of noise at these settings. The upgrades to Sony’s RX100 V autofocus and burst shooting frame rate are welcome improvements for photographers after a high-performance compact. Its incredible 24fps frame rate with full autofocus and exposure tracking, not to mention its ability to capture up to 150 RAW and JPEG files, is some impressive high-speed shooting, and the new 315-point autofocus should improve focus tracking, too. Image quality hasn’t improved over the Mark IV, but it’s still very good for a compact camera. If you can shoot outdoors or in good lighting conditions at low ISO sensitivities, both color and dynamic range are excellent, and noise is respectable up to ISO 800. If high-quality low-light photography is important, however, the higher levels of noise above ISO 800 might be disappointing and may require some smoothing in post-production for better results. If you’re after a pocket-sized high-end compact that you’ll barely notice in your pockets or purse, there’s a good range of options with a variety of sensor sizes and lens specifications. If you’re after a zoom lens similar to the Sony RX100 V, the $599 Canon G7 X and the $699 Canon G7 X II both feature a 20Mp 1”-type sensor with an equivalent 24-100mm f/1.8 – f/2.8 lens. For a fixed-lens compact that boasts an even bigger sensor, there’s the $599 Ricoh GR II with its 16Mp APS-C sensor and equivalent 35mm f/2.8 lens. The G7 X II offers sensor scores on par with the Sony RX100 V, with the Ricoh GR II slightly ahead for all sensor metrics. If you’re after a compact that delivers the very best image quality money can buy, there are a few full-frame sensor compacts that take image quality to the next level. The $4495 Leica Q Typ 116 features a 24Mp full-frame sensor, a 28mm f/1.7 lens, and more than one stop better color sensitivity and low-light ISO performance compared to the Sony RX100 V. Sony also has its own range of full-frame compacts, too, including the $2798 24.3Mp RX1R and the $3898 42.4Mp RX1R II, both equipped with a 35mm f/2 lens. 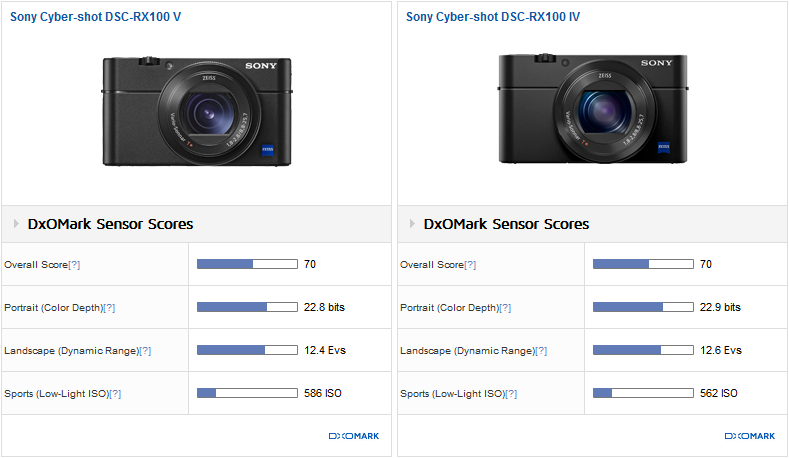 With overall DxOMark sensor score in the 90’s for the Sony RX1 range, these are the top-performing high-end compacts we’ve tested.